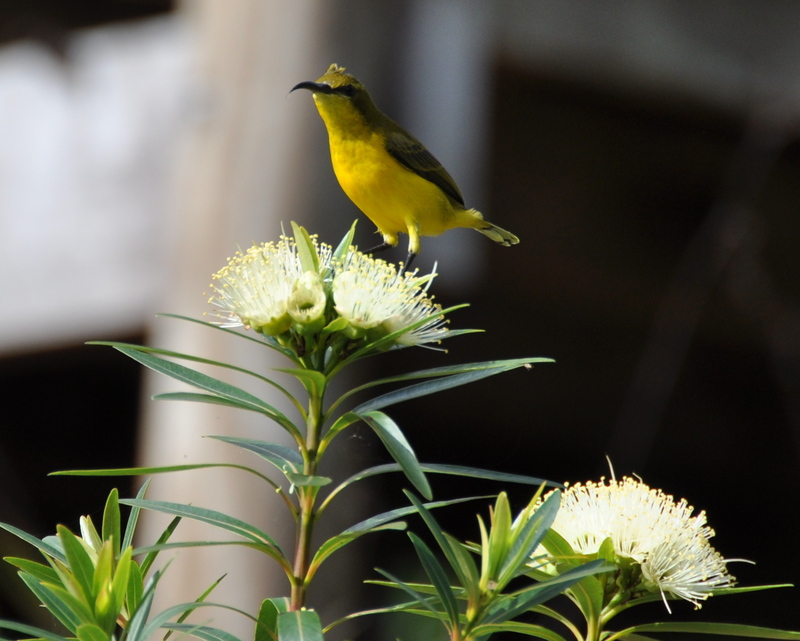 Nectarinia jugularis was commonly known as Yellow-bellied Sunbird but now is referred to as Olive-backed Sunbird…….however, my friend Joanna refers to them as ‘Sunnybirds’ which I think is wonderfully descriptive. 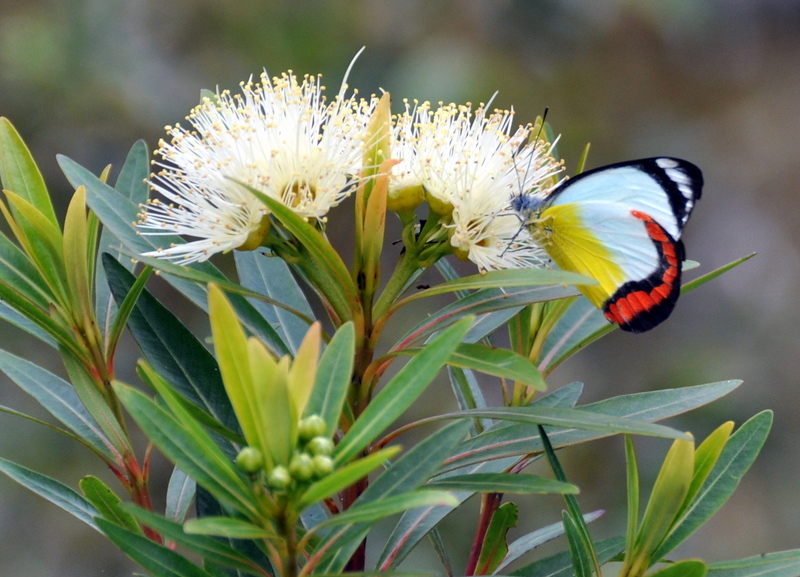 This female was enjoying the plentiful nectar available in the flowers of Xanthostemon verticillatus – Bloomfield Penda. We grew a lot of these plants from seed and have planted them in quite a variety of soil types and situations. They are all thriving but those in full sun are flowering most prolifically. 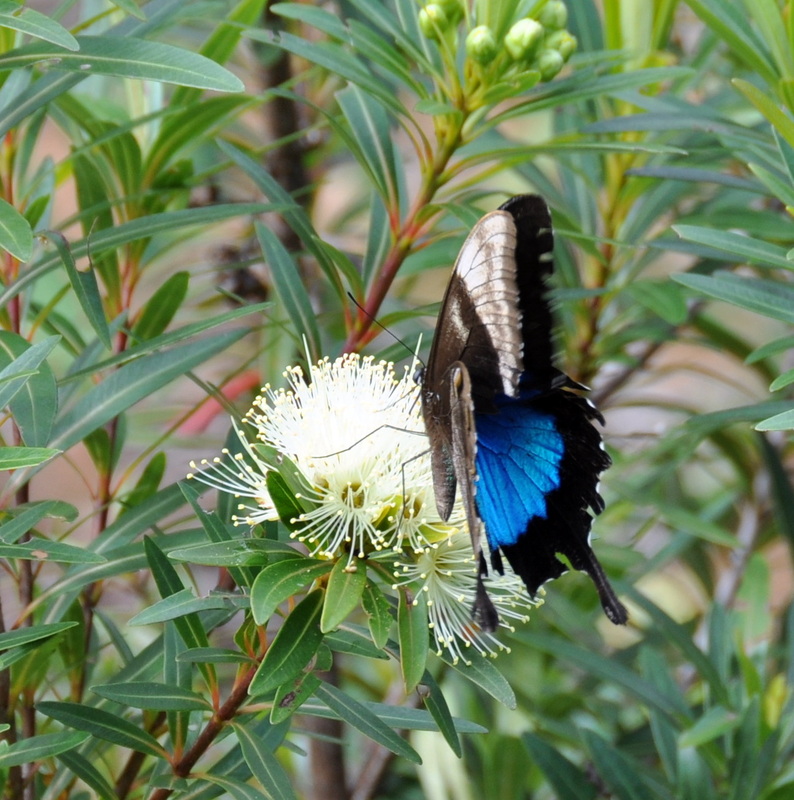 And the Sunbirds weren’t the only creatures to be enjoying the nectar! 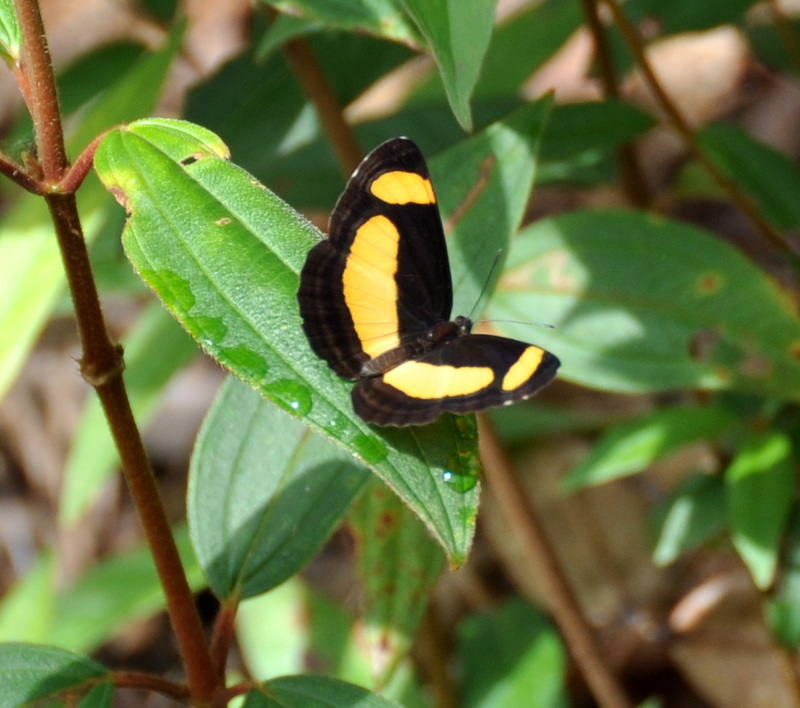 Ulysses butterfly (Papilio ulysses) have their wings closed in upright position while feeding – the dark undersides of their wings are less visible to predators. Flashes of their brilliant blue amongst the flowers are hard to capture but its fun trying! The numerous butterflies making the most of a fine day included – Common Jezebel (Delias nigrina) , Union Jack (Delias mysis) and an Orange Aeroplane (Pantoporia consimilis) …. the latter providing a lovely contrast.with their gliding flight and habit of resting with wings flattened to catch the sun. 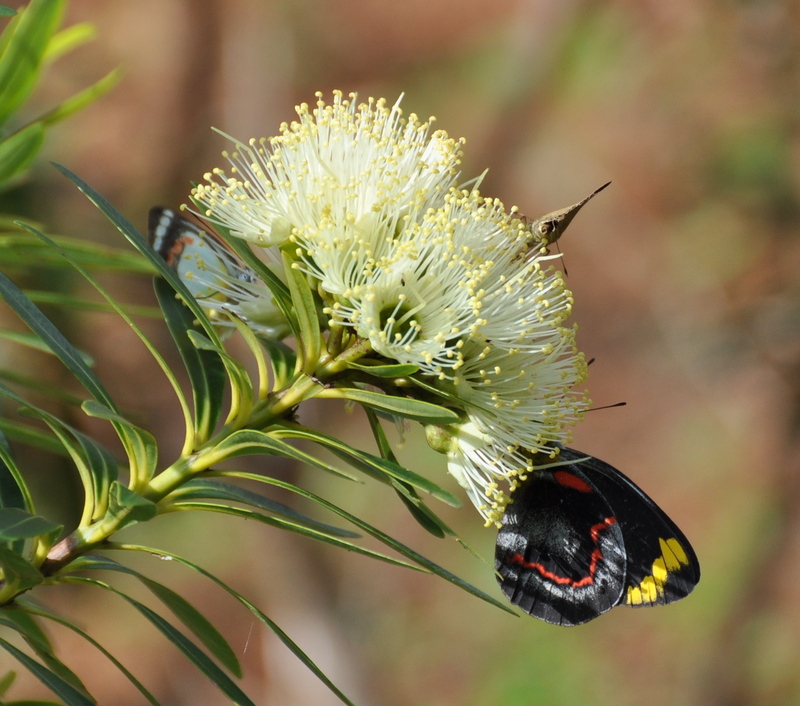 This entry was posted in Bird Observations, Insect Life and tagged Butterflies. Bookmark the permalink. Puzzle with Ulysses: what predators? Never see any attackers. Fairly sure Willie Wagtails will eat any grounded specimen, but they show no interest when butterflies wing by. Good point Tony – maybe their defence is so successful that predators don’t bother? I like the name “sunnybirds”. The butterflies are all making beautiful splashes of color against the flowers. Very satisfying to plant things that will bring in that many birds and butterflies to feed on the nectar. Thanks for your coment Mick, I remember you reporting some similar planting success in your own garden and it is very pleasing.